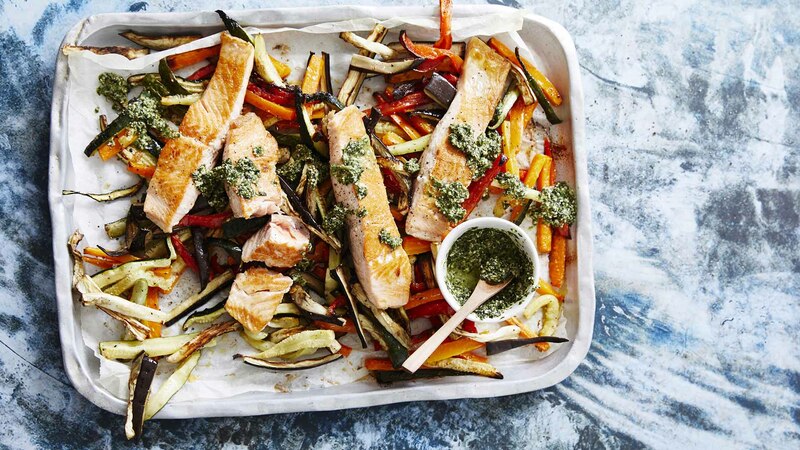 Get all the goodness of salmon in this deliciously light, easy dish. 1. Preheat the oven to 220°C (200°C fan-forced). Line a large baking tray with non-stick baking paper. 2. Place all the vegetables in a bowl and spray lightly with oil. Add the parmesan, season to taste and toss to coat well. Spread over the prepared tray. Bake for 25 minutes. 3. Remove the baking tray from the oven and add the salmon. Season to taste. Return to the oven and bake for 10 minutes. 4. Meanwhile, make the basil pesto. Place all the ingredients in a small food processor and blend until well combined and smooth. Add a little water to loosen if needed. Season to taste. 5. Divide the veggie chips and salmon among serving plates. Top with the basil pesto and serve. Tip: You can add a little water to the basil pesto to make it a drizzle sauce if you like. Recipes and images extracted from Keeping It Off by Michelle Bridges, published by Pan Macmillan, available in all good bookstores.